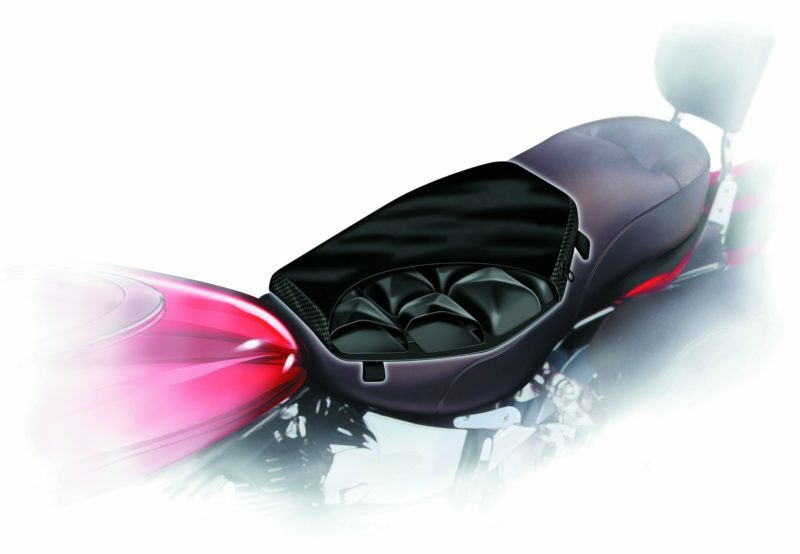 The AIRHAWK DRY FLOTATION motorcyle seat system is a revolutionary accessory in riding comfort. Successfully used for many years by the medical industry (wheelchair and bed ridden patients) and the aviation industry (long distance pilots), it is now available in a motorcycle configuration. 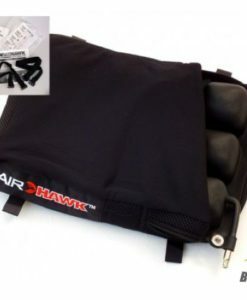 The Airhawk uses supple interconnecting air cells in a patented cell that cushions your ride. Fitment is a simple task making it ideal for long distance motorcycle touring. 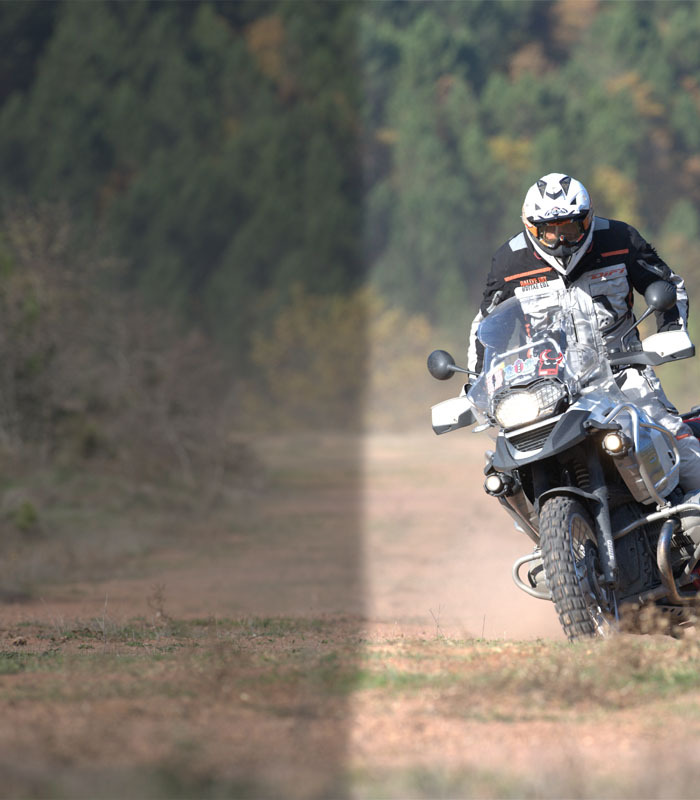 Removal is as simple for technical riding conditions. 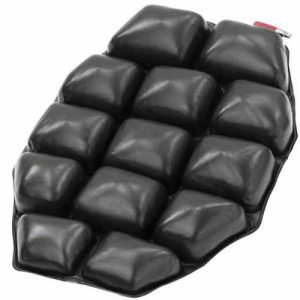 A must have motorcycle comfort accessory! 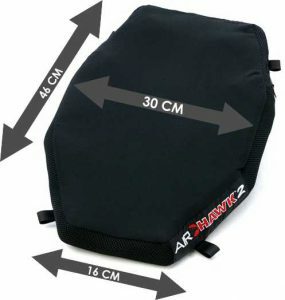 On any standard touring seat, pressure points build where you make contact with the seat, cutting off your blood supply to your buttocks and legs as well as increasing the risk of circulatory problems. 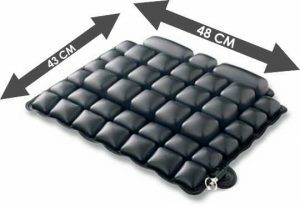 No matter how soft the seat is, your weight will compress and stiffen the foam, which removes any shock absorbing benefit. Ultimately your spine ends up becoming a shock absorber. 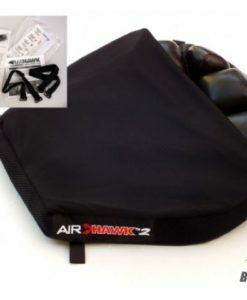 With the AIRHAWK’s patented DRY FLOTATION system, painful pressure and shock points are removed through the promotion of consistent blood flow for a longer more comfortable ride. The last mile truly does feel like the first. 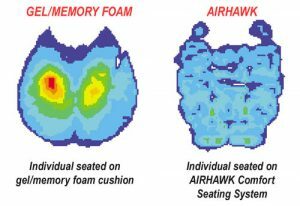 The remarkable difference between the AIRHAWK DRY FLOTATION system and conventional gel/memory foam seat systems can best be illustrated as follows: Imagine placing a gel pad over rough ground and then lying down on it. You would still feel the rocks and ground imperfections underneath. However, if you were floating in a shallow swimming pool you would not feel the rocks and rough ground beneath you. 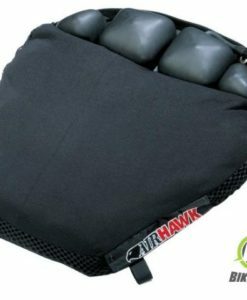 Such a floating sensation is the essence of the AIRHAWK DRY FLOTATION system and is achieved via a unique handmade air cell cushion. The cushion is made up of individual, interconnected air cells that allow air to slowly transfer from cell to cell evenly distributing body weight pressure for a custom fit to your personal contour. Each cushion is individually handcrafted as it cannot be injection molded. 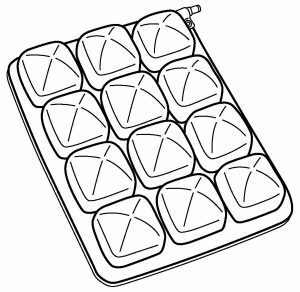 The process involves repeated dipping of the waffle mould into a proprietary solution followed by a combination of air and oven curing. 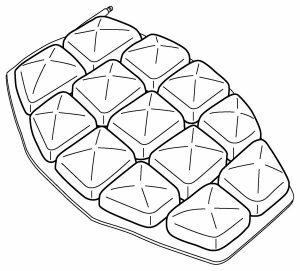 The cells thus formed are then attached to the backing, making sure each cell remains connected to its neighbours. The process is undertaken by hand requiring 24 working hours to complete each cushion. The entire product is manufactured in the USA to the highest of quality standards. Fully customizable and portable, use it on any bike, for any rider. 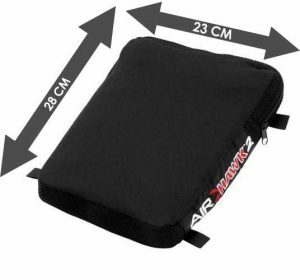 Quick and easy to remove, swop it from one bike to another in under a minute or take it with you as an auxiliary seat or camping pillow. 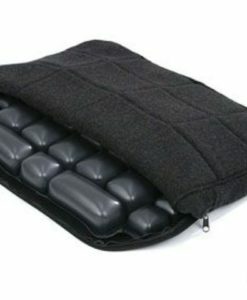 Small interconnected air cells evenly distribute your weight and pressure over the whole cushion, reducing the “hot spots” that cause pain. The air cells also work as mini shock absorbers, reducing vibration. Once you’ve tried it, you won’t ride without it. 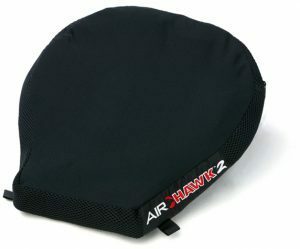 The cover for the AIRHAWK has open mesh side panels allowing air to circulate between the air cells and out the side of the cushion, reducing heat build-up and keeping you cool and dry. 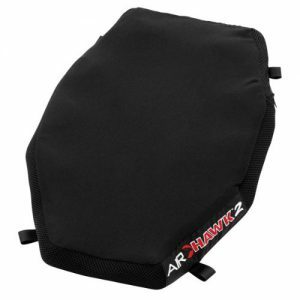 The inner AIRHAWK is waterproof, while the cover material is made of quick-dry material, just in case it gets rained upon. 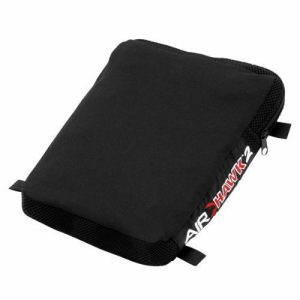 Every AIRHAWK is handcrafted and has a breathable, stretchable outer cover with a non-skid bottom. 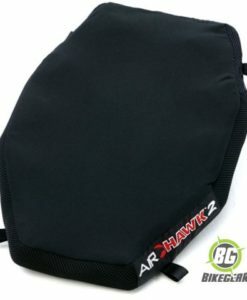 Also supplied are a pair of AIRHAWK Motorcycle Seat Straps which easily attach your AIRHAWK to your motorcycle seat. It will stay where you put it. The red and yellow areas on the left ultra-scan indicate uncomfortable pressure points. The AIRHAWK on the right virtually eliminates pressure points allowing for greatly improved blood circulation. 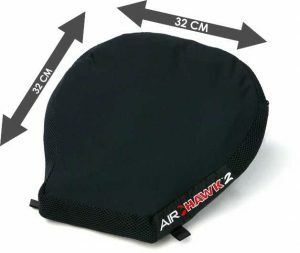 The Airhawk LTV cushion is ideal for people who use mobility scooters, long distance drivers, airline pilots or anyone who sits for extended periods at a time e.g. wheelchair or in front of a computer at the office. 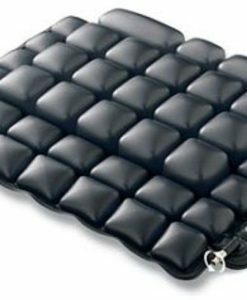 The secret to the extraordinary comfort of this multi-cell air cushion is the valve! It lets you customize the seat to your specific comfort level. “You’ll Love That Valve! Adjustable 2-5  cm. 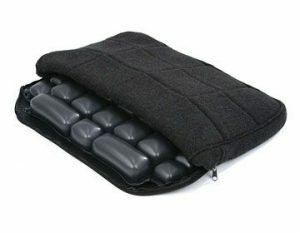 Supplied with a wool cover and hand pump. Please note this unit is NOT designed for motorcycle use. Designed for Cruisers such as the Harley Davidson but can be used for other touring bikes such as the BMW GS 1200 (with dual seat). 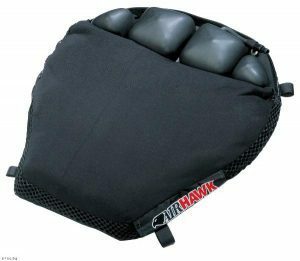 The Driver Airhawk Motorcycle Seat is patented system that eliminates painful pressure points,enabling you to ride in comfort for longer periods. 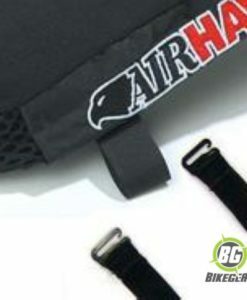 Airhawk Replacment Straps for the Airhawk comfort seating system. 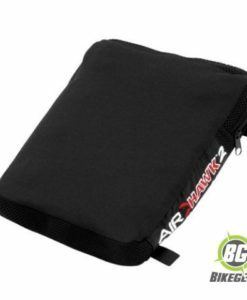 The passenger  Airhawk Soft motorcycle Seat with proven, patented DRY FLOTATION system removes painful pressure & shock points.